Keith Curle’s tendency to make regular changes in formation and personnel between matches will only be a temporary measure until he obtains a clearer understanding of the strengths and weaknesses of his squad. Curle has yet to name an unchanged team during his two months and 14 games in charge of Northampton, frequently bringing players in and out of the side while also altering the system between 3-5-2 and 4-4-2. The important thing is that we’re going into a very, very busy period and we need as many people out of the medical room. The more headaches they give me and the options I have, it gives us a better opportunity. That has applied even when the Cobblers have played well and won games, and although he’s not been aided by injuries and suspensions, it’s a conscious approach by Curle to discover all about his players, albeit not necessarily a long-term one. 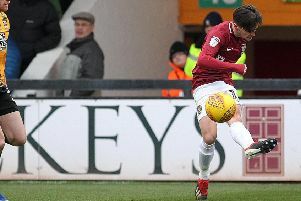 Curle introduced another system for Tuesday’s EFL Trophy clash at Cambridge United when he again went with three at the back, but this time in a 3-4-3 as Billy Waters and Junior Morias played either side of Andy Williams. Morias was making only his seventh appearance of the season having been frustrated by injury and suspension, while young Jay Williams was also given another opportunity to impress in defence. Curle added: “It was an opportunity to have another look at Jay. He’s done very well in the youth team and his progression now is stepping up and being involved in men’s football. “He coped with the physicality side of things very well (on Tuesday). Some of his decision-making will improve but you have to take into account the nerves. “He’s been desperate to play and to get himself out there, which is pleasing, and it’s exactly the same with Junior who’s been chomping at the bit to get in the team. “He was frustrated and angry and disappointed because of how he got sent off in the Lincoln game, but he’s been comping at the bit and there are still other players who need game-time. “We had Dean Bowditch on the bench and he’s desperate to play. He was disappointed when I made the three subs and he wasn’t involved in that but he’s only been back training for one and a half days and what you can’t afford to do is put him on, risk him and then not have him available.